The Christmas tree is the single most important decoration you'll buy over the festive season, so you'll want it to be the star of the show. But if you tend to end up with the short, fat tree or the spindly, leaning Christmas tree, perhaps you need a little help before you buy this year's? We've got some expert advice on what to look for, the best variety to choose, and how to care for your selected seasonal spruce so your Christmas tree is the star of the show (not the understudy). This is a decision that largely comes down to personal preference. Some of us can't forego the smell of pine and asymmetry of a real spruce, whereas others would prefer to invest in a no-fuss artificial tree that can be lugged down from the loft year after year. When it comes to sustainability, this tends to divide people too. Many will argue that being made of plastic, an artificial tree can never be sustainable, however some companies make their trees out of recycled plastics (check out Lomos). There is still the argument about what you do with a plastic tree when it reaches the end of its life, as it inevitably will, after many years of use. On the other hand, cutting down millions of trees every year so we can put them in our homes for a month does not scream sustainability. Thankfully, a real tree is carbon neutral, taking as much carbon dioxide from the environment as its production and transportation creates. Christmas tree farmers also plant a sapling in the place of every felled tree, and don't forget that a used tree can be recycled. 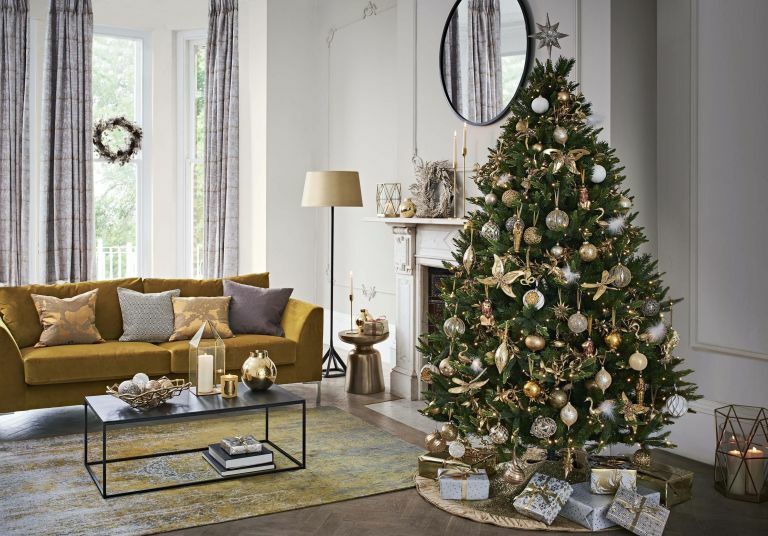 There are some really good artificial trees out there that won't drop, are low maintenance and can be used year after year – see our buyer's guide to artificial trees. If you can, choose a British-made artificial tree which won't have been transported too far. The British Christmas Tree Growers Association (BCTGA) estimates that six million real Christmas trees are sold in the UK each year, so make sure the tree you are choosing is sustainable and eco-friendly. Where possible, buy direct from the grower so you can see where it has come from. This is also the greenest option as you won't have to add transportation to seller into the tree's carbon footprint. If you do buy a Christmas tree from a seller rather than a grower, check it comes from a member of the BCTGA to guarantee it is British grown. An imported tree will have been out of the ground for longer, so will probably begin to drop its needles earlier. It will also have likely travelled from Scandinavia, increasing its carbon footprint. See more on sustainability below. Avoid pre-wrapped stock as you cannot properly assess the shape, width or quality, and measure exactly the ceiling height of the room where the tree will be placed – there may be an allowance of up to 15cm on the measurement shown on the tag. Factor in, too, the dimensions of the stand, which will add to the overall height. Since the 1990s, the Nordmann fir, with its highly acclaimed ‘non-drop’ needles, has become the UK’s bestseller. It remains a more expensive option on account of the time it takes to grow, but with its citrus smell, and lovely soft needles, it is a great option for families with young children. The reliably triangular shape tends to be slightly more open and less dense than Norway spruce, so it is ideal for those who prefer baubles and other hanging decorations aplenty. Although the Norway spruce accounts for just 10 to 15 per cent of UK sales, it remains the ‘traditional’ species for the British Christmas tree. Its triangular shape, dark green needles, gently drooping branches and distinctive ‘pine’ fragrance are the very essence of Christmas, and its dense bushy shape is excellent for decorating. It is also quite cheap when compared to other options. It does tend to shed its needles quite freely, however, particularly as the festive season progresses. Offset this by bringing it inside later than other varieties; keep it well watered and away from direct heat sources. Related to the Norway spruce, this is one of the most attractive Christmas trees, with a good natural shape, and distinguished by the striking blue-green – sometimes almost electric blue – needles. These are very sharp, however, so take care when handling it. Although its foliage is slower to drop than that of the Norway spruce, it is not a non-drop option. It does have a wonderfully distinctive ‘pine’ scent, and is so attractive that it commands attention even before it has been decorated. Introduced into Britain in 1830, noble fir is a native of the forests of Washington and Oregon, where it grows to a great height. Although it is thick stemmed, which can make it difficult to use with a tree stand, it has lovely, well-spaced foliage. A new entry to Christmas trees in the UK, the blue-green Fraser fir is very popular in the eastern United States, and its narrower shape makes it ideal for smaller spaces. With dense foliage, it’s not ideal for bauble devotees, but with a minimalist approach, and plain lights, it can make a wonderful centrepiece. An eco-friendly Christmas tree should be farmed in such a way that it has a positive impact on the surrounding environment. Members of the BCTGA have strict guidelines to follow on where they buy their seeds, what pesticides and herbicides to use and how to harvest their trees. Where use of pesticides is unavoidable, farmers will use chemicals early in the year when wildlife and insects haven't moved into the forests. Only a small percentage of a Christmas tree farm is felled every year. This means that there is a constantly changing but permanent eco-system in which British wildlife can thrive. One condition of a BCTGA membership is that trees can’t be felled if there are animals nesting in them. As all felling occurs close to Christmas, it is very rare that it impacts upon the resident wildlife or the farm production itself. A real Christmas tree needs to be transported from farm to house, so even if grown locally, it will still have a small carbon footprint; however, they have a 10 to 15 year lifespan, during which time they are absorbing carbon dioxide and releasing oxygen.There is an estimated 12,000 hectares of Christmas tree farms providing this natural benefit in the UK. If you buy a synthetic Christmas tree, maintain it as best you can and use it for as long as possible, thereby minimising its impact on the environment before it goes to landfill. Most local authorities run a tree recycling service, or members of the British Christmas Tree Growers Association will recycle them free of charge. Alternatively, cut up the wood and season it for at least a year to use as firewood, or chip it to use on garden borders. These are trees that have been prepared so that they can be dug up, ideally with a full root system. In practice, this is often difficult to do and, because they have no soil around the roots, the trees must be freshly harvested. Bare root trees still need potting up and, although they remain fresher than a cut tree, usually have only a slim chance of re-establishment if planted in the ground after Christmas. If you see trees described as ‘potted’, this simply means they have been lifted from the ground (usually as bare root stock) and plunged into a pot; the chances of root damage are high, and survival low. Having spent most, if not their entire, lifespan in a pot, these trees come with a good root system. As long as they are kept cool and the compost damp, they should survive the rigours of Christmas and are the best option if you intend to keep or establish them in the garden. They are usually quite small specimens (seldom more than one metre) and can be more expensive. After Christmas, pot-grown trees can either be planted out with a very good chance of success, or left to grow on in the pot. If choosing the latter option, re-pot the tree into a larger pot in late winter, using a soil-based John Innes potting compost. This can be done annually, until the tree reaches the maximum size that can be moved comfortably.